Hurricane Raymond's winds peaked at 125 mph yesterday afternoon. 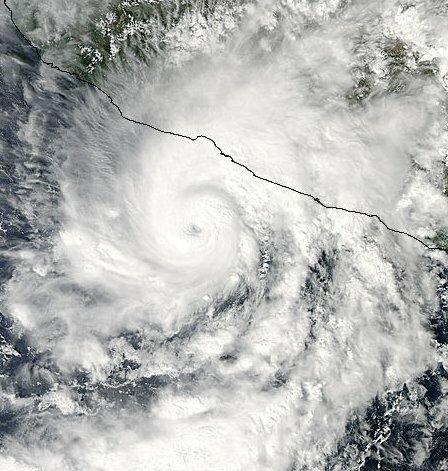 The hurricane center has dropped winds to 115 mph which is still a minimal category 3 hurricane. The IR imagery below shows the drastic change in the eye structure. Because of this, my estimate is considerably lower than the official estimate of sustained winds. A recon is scheduled later today and I suspect that NHC will drop their winds lower with the official confirmation. Rainfall of over 10-15 inches is possible, especially in the mountains just inland. High swell will continue. 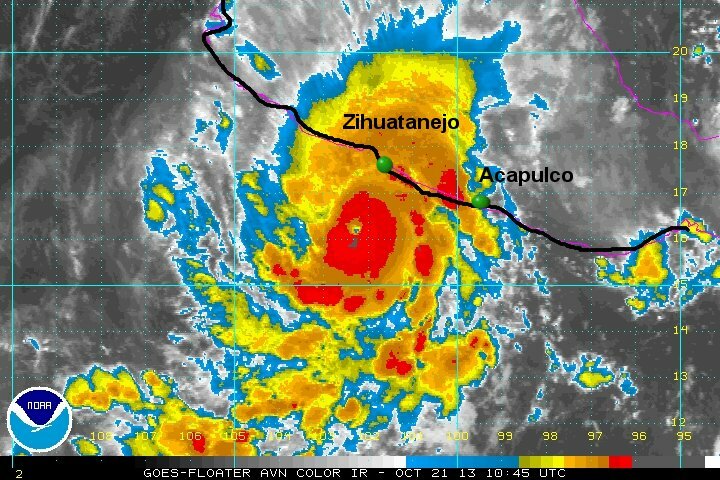 As of 2 am pdt (5 am edt) Raymond was centered near 16.5 N / 102.0 W or about 85 miles SSW of Zihuatanejo, Mexico. Movement is stationary. 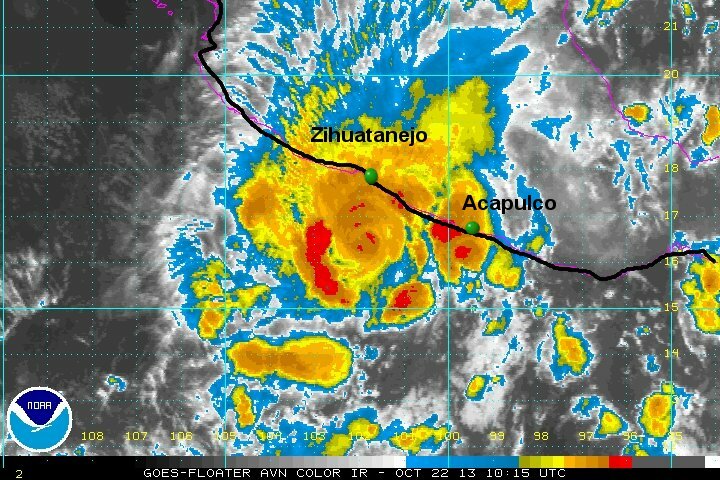 Top sustained winds are estimated at 100 mph (NHC 115 mph / 2 am pdt advisory). Pressure is estimated at 959 mb. Raymond should continue to slowly weaken and drift farther to the west out to sea during the next 24-48 hours. Note: conditions on the coast could deteriorate if Raymond jogs only slightly farther to the east. NHC dropped winds from 115 mph to 90 mph. They were waiting for the recon to drop the winds. This more closely matches my 100 mph estimate at 5 am edt. The eye is trying to reappear with good banding. The 90 mph estimate looks good now. Visible satellite imagery shows that the deep convection associated with Raymond has been stripped away from its circulation. Because of this, my estimate is much lower than the official NHC estimate. 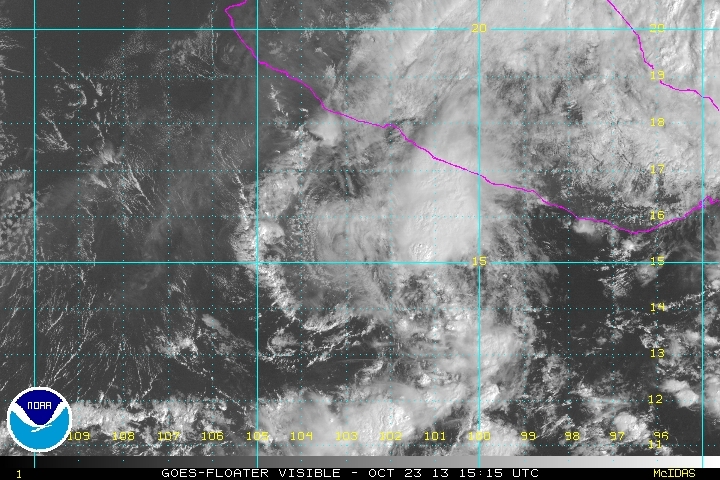 As of 8 am pdt (11am edt) Raymond was centered near 15.4 N / 103.0 W or about 185 miles SSW of Zihuatanejo, Mexico. Movement is WSW at 8 mph. Top sustained winds are estimated at 40 mph (NHC 60 mph / 8 am pdt advisory). Pressure is estimated at 996 mb. Raymond should continue to slowly weaken and drift farther to the west out to sea during the next 24-48 hours.